A family of cowardly orcs, a path to follow to overcome one’s own fears and the knowledge that we can do it together. These are only a few of the elements of this cooperative game. 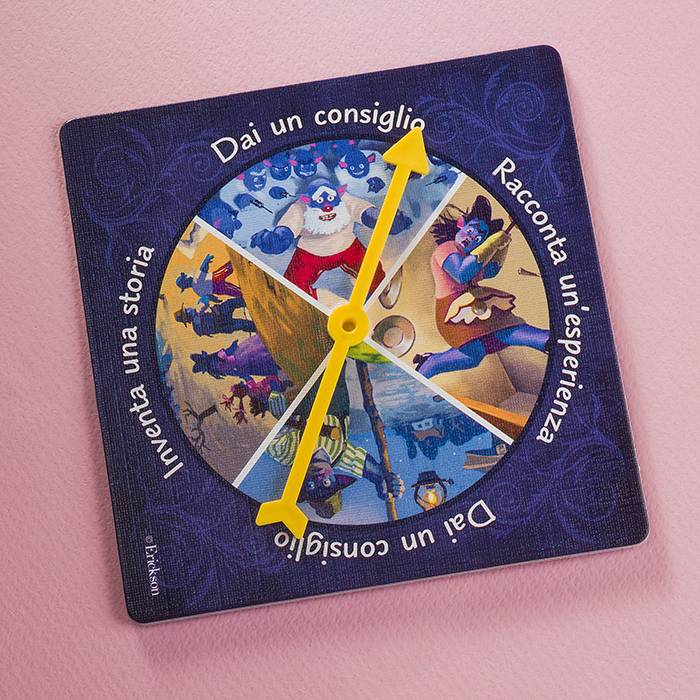 Children need to move along the game board and – choosing “Courage” cards or “Talk about it” cards – overcome and beat the group’s fears: everyone helps each other, and the different fears are overcome by talking and finding shared solutions. Only by talking, interacting and collaborating, can the whole De Orchis family arrive at the finish line and defeat the small and not so small fears that concern each of us on a daily basis. 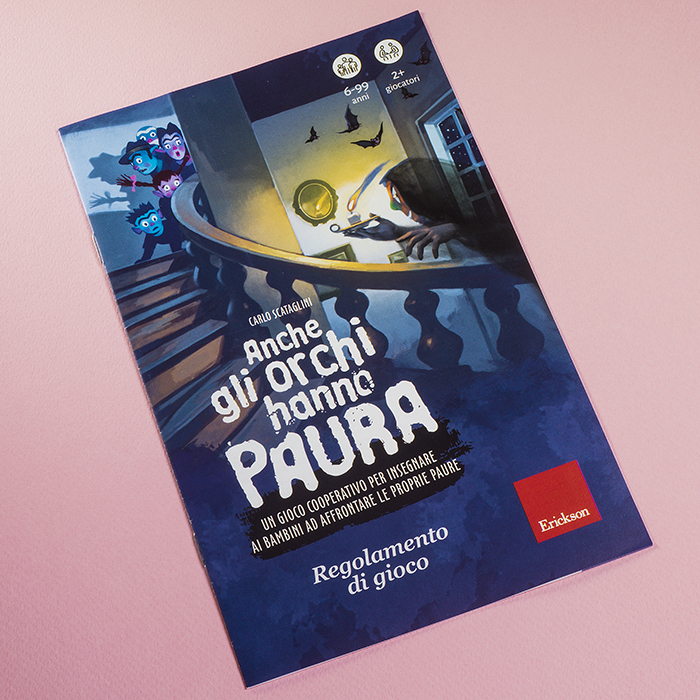 The narration and the cooperative game allow adults to gently approach the emotional world of children and help them to express themselves by offering several points of reflection on how, many times, it is possible to overcome fears with ease, especially if you decide to share them. «It seems absurd, but it’s the truth. We ogres are big cowards! We are afraid of a million things, sometimes even our own shadows. But we can’t choose what to be afraid of...». 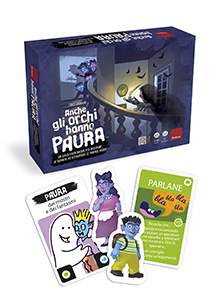 EVEN OGRES ARE AFRAID is a cooperative game that is meant to encourage children, teenagers, and adults to develop new strategies for overcoming their fears. 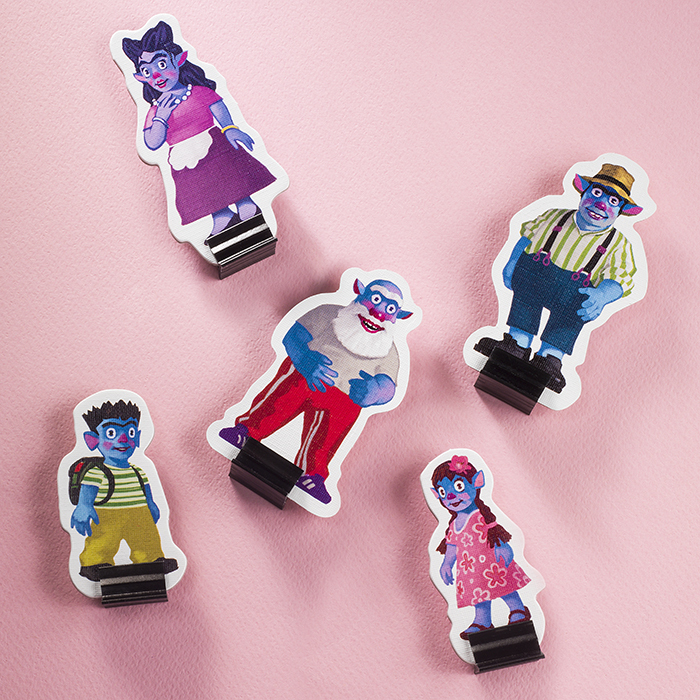 Along with the De Orchis family, a family of ogres at the mercy of their fears caused by the sneaky Terribilius, everyone plays together by talking, interacting, and cooperating while trying to find a solution to the fears that they come across during the game. 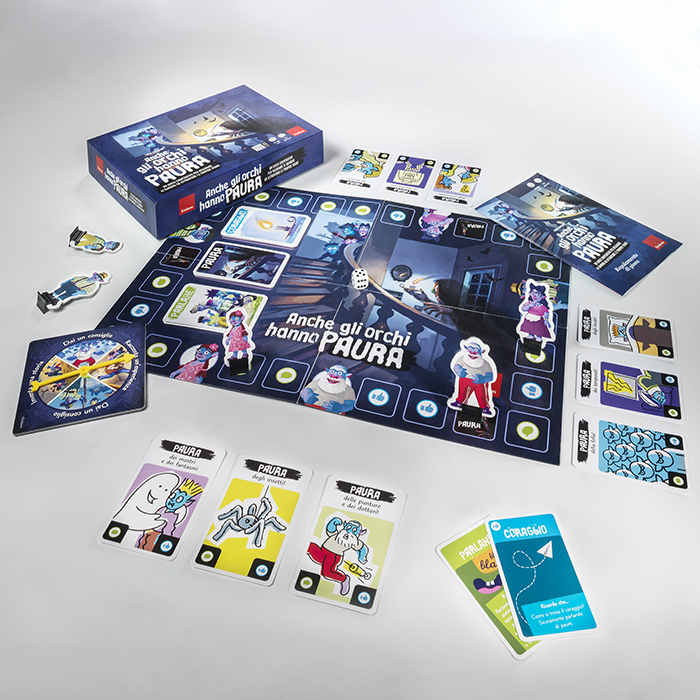 Place the game board at the centre of the table and divide the Fear Cards, Courage Cards and Speak Cards into their respective piles. Mix each pile of cards and place them on the game board in the spaces indicated. Prepare the 5 game-piece cut-outs and the spinner, and place the dice on the game board. Now you are ready to start! This game is for 2 to 5 players (if there are more players, you can play with a maximum of 25 players divided in teams). The game requires the presence of an adult. The adult can play actively on a team, or restrict him/herself to intervening only when needed to facilitate dialogue or to enforce the rules of the game. We suggest that the adult choose the first option: often participating in the game is the best way to inspire trust and create team spirit with the other players! 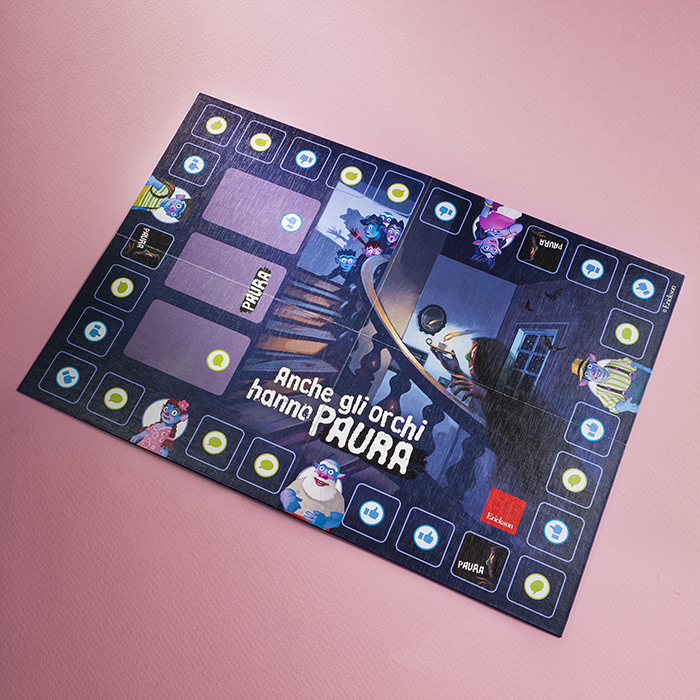 Game pieces: each team choses their own game piece from among the members of the De Orchis family and places it on the matching square on the game board. Each team then receives a certain number of Fear Cards based on the following chart. The cards are placed face up on the table so that all players can see them. After deciding the order of play (based on who rolled the highest number), the winning team/player rolls the dice and moves his/her game piece the number of spaces rolled. According to which space he/she lands on, a Courage Card, a Speak Card, or a Fear Card is drawn. If the player lands on the BONUS space, he/she gets another turn. 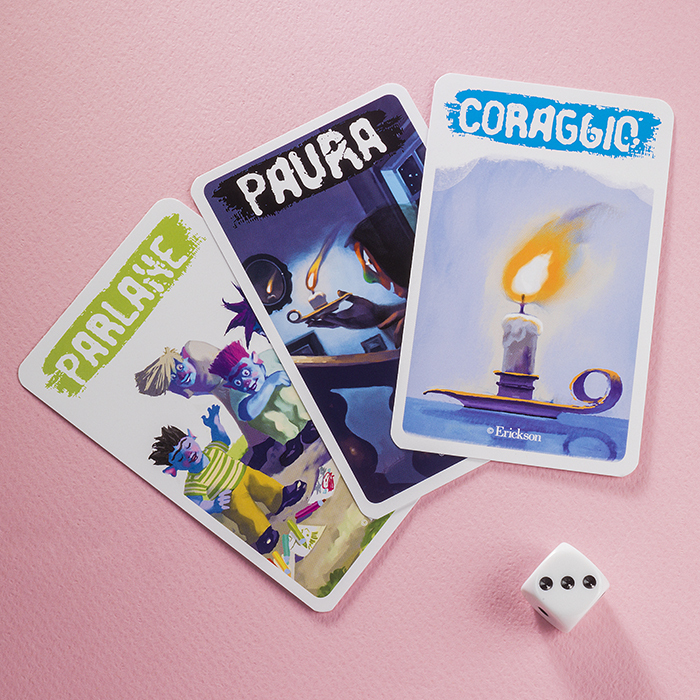 After moving the game piece, the team can decide whether to use a Speak Card or a Courage Card to eliminate the Fear Card in play. It is then the next team’s turn. Each player has their Fear Cards visible to everyone. 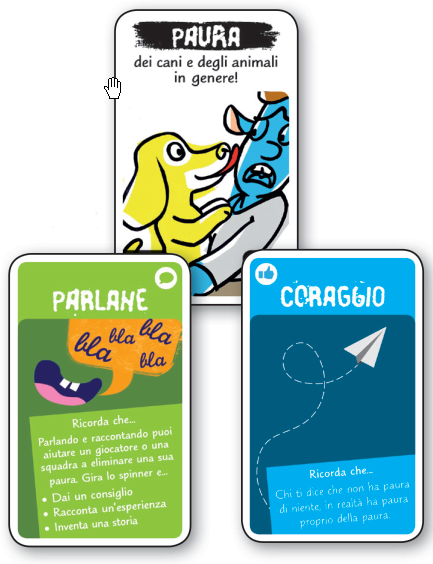 To eliminate the Fear Cards, it is necessary to FIRST use a Speak Card and THEN a Courage Card. Only after these two steps have been taken can the Fear Card be discarded at the bottom of the pile. Each player can only play one card per turn, so team work is fundamental. To free oneself from fears, it is necessary to open up and talk about them, and then listen to other people’s advice. To eliminate a Fear Card the first step is to talk about it! 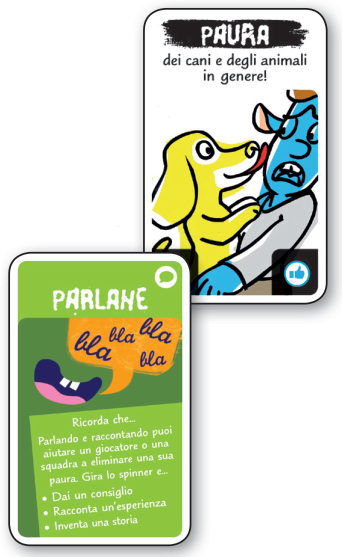 When a player uses a Speak Card, he/she must correctly place it on the matching corner of the Fear Card he/she	wants to speak about. It can be a card from his/her own team, or from another team. Everyone on the team can participate. When the Speak Cards are being used, anyone can ask questions to the player who is speaking. Once this step has been completed, the Speak Card remains placed over the corner of the Fear Card. If there is already a Speak Card placed on a Fear Card, a Courage Card can be played to try and eliminate it. Each member of the team can participate in trying to find solutions for facing and overcoming that particular fear. The players are free to say what they feel is best to overcome a particular fear. The adult can help and direct.